Mario Balotelli will not endear himself to the Liverpool faithful after being seen swapping shirts Real Madrid defender Pepe at half-time - with the Reds 3-0 down. The Italian endured another goalless 45 minutes in a Liverpool shirt as Champions League holders dominated the opening half of the Group B clash at Anfield. With home fans already angry at his lacklustre showing, Balotelli then risked irking them further by swapping shirts with Pepe before entering the tunnel to the changing rooms. It was Balotelli's last action of a rather ineffective night as he did not return for the second-half with manager Brendan Rodgers hauling him off in favour of Adam Lallana. "It's something that I don't like to see," Rodgers told Sky Sports. "I've seen it happen in other leagues and in other countries but it's certainly something that doesn't happen here and shouldn't happen. "We had an incident here with a player last year (Mamadou Sakho) which I dealt with and if that's the case then I'll deal with that as well." Madrid boss Carlo Ancelotti was more laid back about the shirt-swapping, telling reporters: "I think it is nothing new. 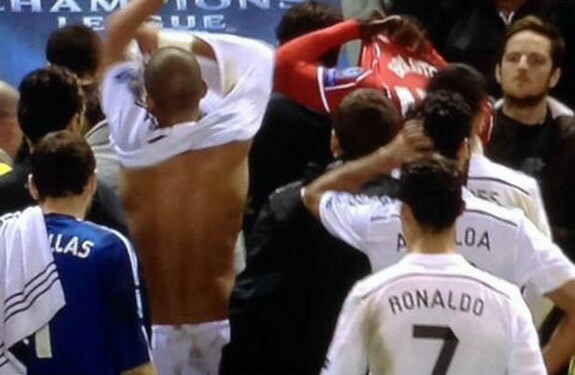 Sometimes the players change their shirt at half-time with the opponent. I don't see a problem."